A nutritionally complete diet includes omega-3s such as life’sDHA™. DHA (docosahexaenoic acid), an omega-3 fatty acid, is a major structural fatty acid in the brain and eyes, and a key component of the heart. DHA is the only omega-3 that has been shown to support brain, eye and heart health throughout every stage of life. * Yet the typical American diet usually falls short of recommended DHA levels. Unlike other sources of DHA omega-3, life’sDHA™ (formerly called Neuromins) comes from a vegetarian source (algae), grown in an FDA-inspected facility. Because life’sDHA™ is not from fish, there is no worry of ocean-borne contaminants. Inform your health care professional about this product. Keep in a cool dry place with cap tightly closed. Keep out of reach of children. Other ingredients: Algal oil, modified corn starch, glycerin, high oleic sunflower oil, water, carrageenan, sorbitol, ascorbyl palmitate and tocopherols (antioxidants), natural flavor, sunflower lecithin, beta-carotene and caramel (coloring). Each bottle contains 60 softgels. 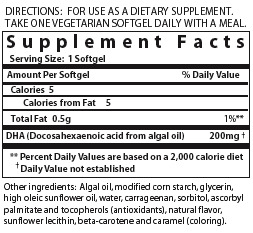 life’sDHA™ vegetarian softgels are encapsulated in a vegetarian capsule making them 100% vegetarian.